We are so confident that you will love our Raffle Tickets that we would like to send you a free sample. 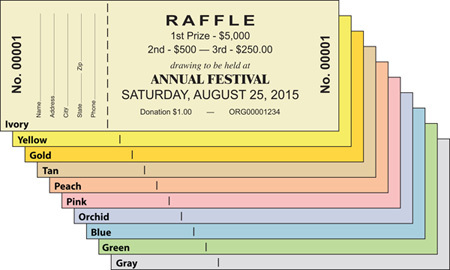 Our Raffle Ticket sample kit includes one printed raffle ticket complete with numbering, perforation and all safety features plus 9 unprinted paper samples to show our complete range of paper colors. Raffle Ticket samples will be mailed by United States Postal Service on the next business day after we receive your request. We will send a confirmation to your e-mail address.